As you may or may not know, the Nipissing University Faculty Association is currently on strike. As is generally the case in recent faculty negotiations, money is the least of their worries. They face an administration that is bent on shaving away the regular faculty complement and in pushing faculty to the margins of university governance. I spent some time Tuesday with the small but passionate group of regular faculty from Nipissing’s Faculty of Education at the Laurier Brantford Campus. They were welcoming, warm and thankful for the extra body! 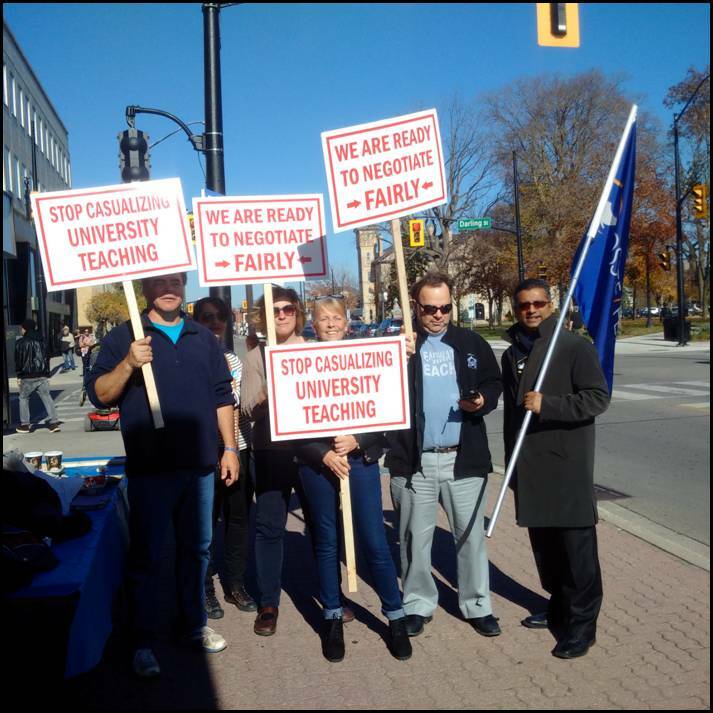 In addition, Niru Philip, President of our WLUSA local of OSSTF, joined us on the picket line. Because there are so few (about a half dozen) Nipissing regular faculty left in Brantford, this small group is charged with keeping a picket line going as much as they possibly can. They are forced, then, to carefully schedule “walking the line”. Their next day on the street is this Thursday, Nov. 5 – and they’ll be at Market and Darling from about 8 to 4. If you’re anywhere in the vicinity – and can spare even 30 minutes of your time to stand with them – I know they would appreciate it a lot. Introduce yourself to Mike McCabe – picket captain – and he’ll set you up with a sign!